From the moment that Barrichello slid into the wall in qualifying, thereby ending Q3, this looked like Lewis Hamilton's race. From pole position he is generally unbeatable, sailing off into an increasing lead from the start. In Singapore he had Rosberg and Vettel in close company for the first stint but they did not seem threatening, even their lighter fuel loads being insufficient for them to challenge him. The fact that both the Williams driver and the Red Bull man put themselves out of contention with drive-through penalties for pitlane offenses left Lewis without serious competition and he duly cruised to victory. Behind him, both Glock and Button demonstrated the value of keeping out of trouble and letting others make way for you. Glock raised Toyota spirits with an excellent second place and Jenson did the necessary, finishing one place ahead of his nearest championship contender, Barrichello. This was not a classic motor race, overtaking being almost non-existent and little to grip the viewer as a result, but the setting is so dramatic that I am inclined to forgive the circuit. With the organizers apparently willing to make changes to the track, a few alterations to corners, as suggested by KNF in the comments to Keith Collantine's article on the facts and figures, could solve the passing problem. Perhaps the most interesting points of the weekend were the strange coincidences with last year's race. Romain Grosjean's crash in practice, almost identical to Piquet's infamous and self-induced exit from the race, was one, but less noticed was the repeat of Massa's clumsy faux pas at the entrance to the grandstand tunnel in 2008. You may remember that Felipe had ruined his race by trailing the fuel hose down the length of the pits in that race, and it was later, when he was trying to regain lost ground, that he spun into the barrier at the grandstand corner. Sutil's Force India was bearing down on him at the time but Massa restarted and drove the Ferrari right into its path. Poor Adrian had nowhere to go and ended up in the barriers. It may have been this experience that led Sutil to think it okay to drive back on to the track without looking and that is exactly how he took out Nick Heidfeld, ending the BMW driver's race right there. But the stewards thought otherwise and handed Sutil a penalty after the race. Had the Force India driver continued for more than the four laps he managed, they might have penalized him sooner. Which is all well and good but leaves me wondering why nothing was done about Massa's dangerous maneuver the year before. As far as I am aware, the rules regarding rejoining the track only when it is safe to do so have not been changed in the meantime; is this yet another example of the stewards' apparent preference for red cars? Ah well, I suppose we must be happy that the stewards are beginning to intervene at more appropriate moments this year. Perhaps the days of seriously flawed and partial decisions are drawing to a close. In Singapore they got everything right for once and their ruling on Webber's pass on Alonso should be examined closely by the Spa stewards - in conjunction with a video of Raikkonen's first lap of the Belgian GP, of course. And, talking of Kimi, it seems likely that he will be back at McLaren next year. All caused by Alonso apparently guaranteed for Ferrari but a better outcome than a Raikkonen retirement, I think. From the very start, I said that he looked out of place at Ferrari and the world will now return to its natural state with him back where he belongs. For those who expect a repeat of the Hamilton/Alonso friction, I suggest a look at Kimi's reaction to being beaten by Massa - best described as complete indifference. The Hamilton/Raikkonen pairing will be interesting to watch but expect no fireworks. I watched the race online via the BBC i-player, there was cricket on the TV :), I had the sound off too, so no commentary was heard, something I actually found quite refreshing. The race was as you say - No classic. The dramatic overhead shots of the various mini-battles showed the aggressive driving style that is employed by Alonso. Particularly against the determined but controlled style of Hamilton. Clive did you hear Brundle on his classic grid-walk say how he would love to speak to "Teflonso"? Brundle is on the mark nothing sticks with Alonso. The race was boring and the comment somebody in the media made that 2009 is only so exciting because we are watching mediocre drivers fighting for the championship is sounding more and more true to me. Vettel constantly proves that point and Button is just an enigma. Not much to expect from Webber nor Barrichello. So, again I ask you Clive ;-) you think Rubens smashed his car on purpose so not to start from 15th. ??? I hate to say it but I would imagine that the Massa incident from last year was ignored as they would have had to give him a grid penalty which would have affected his next race. In my eyes the penalties he received were only dealt out as they had no affect on the outcome of the race and therefore his championship position. Having said that I think Sutil has escaped with a fine so perhaps they could have and should have punished Massa in the same way. Although in my opinion it is far to serious a mistake to be dealt with by a fine. Hamilton drove an excellent race and seemed calm even when vettel was right behind. I am please for Glock and toyota as this will hopefully keep their board interested for the coming years. Also hopefully that has now sealed it for Button as he now has far less of a job on his hands and only has to drive sensibly and hope no bad luck falls his way. According to an insider source I know it seems that Alonso signed a Ferrari contract quite some time ago, in fact it seems it may well have been only a few races into this season. Gusto: You have to remember that the Massa incident took place within just a few seconds - I very much doubt that any nearby marshal was quick enough on the uptake to have waved a yellow in the time available. 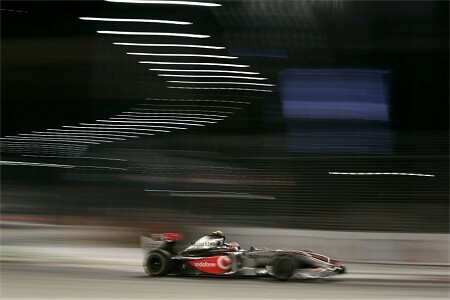 Even if he had, Adrian could not have slowed more than he had already as he was braking for the entrance to the tunnel. The gap was there and he aimed for it, only to have it closed by Massa's impetuous move back on to the racing line. I did not see the Fisi incident you mention; here in America we get SpeedTV's broadcast and suffer from innumerable ad breaks. Perhaps it was during one of these that the incident occurred. Fractal: Interesting thoughts. I think we will find that the FIA's Ferrari preference will go away as time wears on. For one thing, Mosley is going and there is also the matter of Luca's involvement with FOTA to take into account - the FIA will never like that. Alonso at Ferrari will be extremely interesting to watch, especially if Massa comes back fighting fit and having lost none of his speed. I think we would get a much better idea of just how good both drivers really are in that case. I will admit only to the fact that Barrichello's qualifying crash was convenient for him in many ways. But as for reading his mind - that is beyond me. Considering the Renault hooha, it does seem unlikely that Rubens would risk a similar uproar for Brawn, however. Lee: You are probably correct regarding the stewards' reasoning in the Massa incident. But that is my point - rules should be applied evenly, without thought of the effects penalties will have on championship contenders. The guys in lesser cars have a difficult enough task without having to cope with penalties that are unevenly applied. I do agree that the offence is serious and warrants more than a fine. Apart from the safety aspect (which alone is enough to demand a stiff penalty), we should remember that innocent drivers can have their races ruined by the hasty actions of drivers eager only to recover from a mistake. Sutil had reason to be aggrieved last year and Heidfeld this. The Singapore GP is boring! Capital "B" boring. To say it is in a nice city with a nice backdrop is a lesson in Polyannaism (with a capital "P") but what else is there to write about it? Most teams have quit development and are working on next years entrant. Any continuity of focus has been disrupt over and again by the bean counters. Trying to watch the 2009 F1 season has been like trying to study computer programming during a food fight. The parades seem to become far less tolerable when the ninnies hog the limelight. I think, when watching or driving in a race, the backdrop is inconsequential, after all racers and race fans are not run of the mill tourists. The Singapore GP is for tourists! The winner? Not so important as it is known that this race can be fixed. Button 5th, ahead of Barrichello, is the only surprise, and not a very big one at that. In effect I'm happy to see Button ahead of Barrichello, as Barrichello has done his best to install a soap opera in the Brawn team with his sour grapes routine when things don't go his way. It's a pity because he seemed like a pleasant fellow. I wonder how long a person can remain a pleasant fellow in modern F1? Nick: I think that's a bit too hard on the Singapore GP. The setting of a race does affect the way we see it, I think - would Spa be as popular were it not set in the Ardennes with its hills and pine forests? Imagine it in the dockside surroundings of Valencia for instance. Monaco has its very distinct flavor thanks mainly to its magnificent setting and even Long Beach was distinctive with its backdrop of the Queen Mary and palm trees. Certainly it matters whether a circuit has corners like Eau Rouge or 130R but that is not the whole story. I don't know if you, like me, mourn the day Bernie took Paul Ricard away from us, yet its claim to fame was its long straight, not its corners. It was wonderful, a place where you could see F1 power unleashed to its full extent, where the teams could compete for pure speed for a change. The sport needs a variety of tracks that have different requirements and that is the real crime of Herman Tilke - he gives us the same mix time after time. We should know by now that the main problem when it comes to overtaking is the nature of the cars, not the track. As long as we allow aerodynamics to have so much influence on their performance, we are whistling in the wind to expect track changes to improve matters. Tell me which circuit this year has produced expressions of appreciation of great overtaking maneuvers from the fans - there hasn't been even one because it's the cars that cannot overtake, not the circuit's lack of opportunities. Singapore has the potential to become a classic track. Imagine for a moment the cars of the fifties and sixties racing there. Somehow I don't think the cry would be about a lack of overtaking in that case; no, I can hear the whining about safety already. I agree completely that decisions should be made without regard for the positions and championships of the drivers, however as can be seen in the renault punishment, the FIA are not interested in consistency. So there I go, getting carried away also. We both have visions of what F1 COULD be if.... WE were lucky enough to watch before the disease set in. How I look forward to the day somebody with a vision of more than the cash gets into a position of power. I wonder if we'll live that long, or if it is idealism?